The airport community helped to fill cupboards and stomachs when workers joined forces with Hands for Hunger to provide the equivalent of 400 meals – a critical supply of food for the hungry. A humanitarian organization, Hands for Hunger distributes food supplies to 14 agencies and feeding programs throughout New Providence including emergency shelters, substance abuse homes, rehabilitation centers, homes for the elderly and after-school programs which provide free food to its participants. 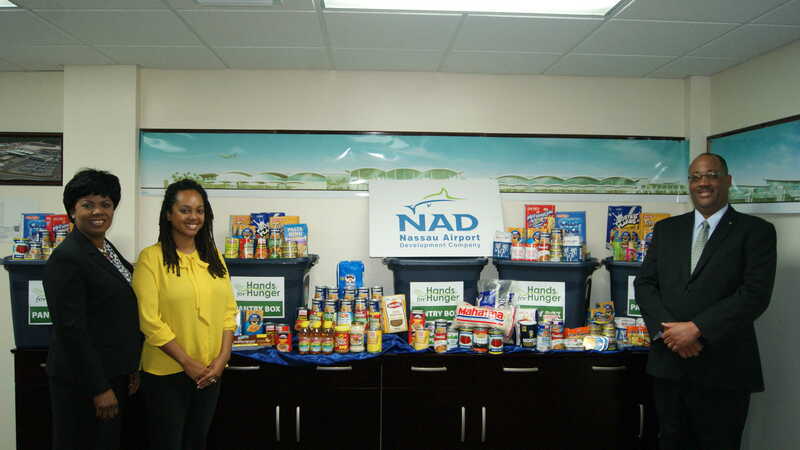 Pictured l to r: Vernice Walkine, President & CEO, NAD, Zeleka Knowles, Executive Director at Hands for Hunger and Milo Butler, III, General Manager at Airport Authority.